In this week’s roundup: What’s going on with the year anniversary of the Unite the Right rally, Gab faces a shutdown and a great documentary on hate. The one-year anniversary of the deadly Unite the Right rally in Charlottesville, Virginia, was always going to be a significant date. Apart from being by far the largest overt white supremacist rally in at least a decade, Charlottesville symbolized much more. Seemingly overnight, the nation’s attention focused on a new breed of clean-cut American racists, with their khakis, polo shirts and Nazi slogans. Countless media hours were committed to understanding how, and why, the racist right felt so empowered in 2017. While the Charlottesville event was always touted as a way to bring together the nation’s racists, the fallout from the event, in which one counterprotester died, has been swift and brutal. And a commemorative rally planned for this weekend in Washington, D.C., Unite the Right II, is likely to be a shadow of last year’s historic event. That’s according to Mark Pitcavage, a historian and leading expert on right-wing groups who works with the Anti-Defamation League. Pitcavage expects perhaps a few dozen white supremacists to show up at Unite the Right II, slated to take place Sunday afternoon in a park opposite the White House. That would be about standard for the average white supremacist rally, Pitcavage said. It’s also a far cry from the estimated 500-600 racists who showed up in Charlottesville last year. There are two main reasons why Unite the Right II isn’t expected to be as widely attended as the first. Second, after Charlottesville, a lot of the event’s attendees learned very quickly what happens to people who openly declare their racism. In the weeks following the event, their lives were radically altered after being outed by internet sleuths. In Berkeley, California, an electrician lost his job. So did a hot dog purveyor. Just because this weekend’s rally is likely to be small, however, doesn’t necessarily mean it won’t end in bloodshed. As Charlottesville proved, it only takes one angry person to cause havoc. Recent clashes in Berkeley and Portland, Oregon, between far-right protesters and counterprotesters aligned with the antifa movement have led to arrests, fights and injuries. They were far smaller than Charlottesville. But the venue of Sunday’s rally is likely to limit chaos and injury. Unlike small-town Charlottesville, Washington, D.C. police have plenty of experience dealing with large protests in front of the White House. The city has already put in place plans to keep protesters apart and even considered arranging separate metro trains for the white supremacist protesters who show up. That plan has since been abandoned. 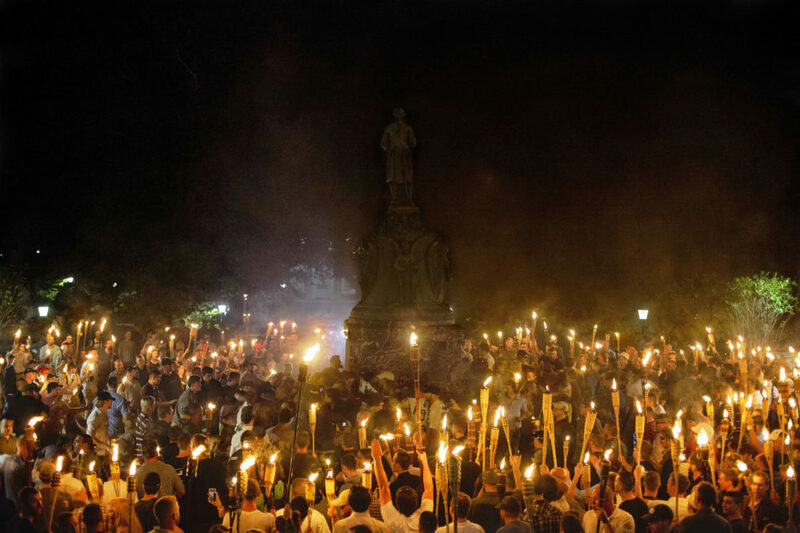 Violence is always a possibility, but the likelihood that Unite the Right II will be as seminal a moment in American politics as last year’s Charlottesville rally seems a long shot at this point. While the ground-level success of the Unite the Right II is up in the air, some in the hate movement have been doing pretty well online. Several neo-Nazis have spent recent months raking in donations in the form of the virtual currency bitcoin. According to cybersecurity researcher John Bambenek, who operates a Twitter bot that automatically tracks the transactions of bitcoin wallets belonging to high-profile white supremacists, the neo-Nazi website The Daily Stormer has received more than $47,000 in bitcoin donations since the beginning of May, far above its normal haul. This bounty represents the biggest spike in donations to the site since the run-up to first Unite the Right rally last year. In general, bitcoin donations are relatively secretive, but the public ledger used to maintain the system allows anyone to monitor the money moving in and out of every bitcoin wallet. Bambenek has been able to link these wallets to specific white supremacists because their owners have publicly listed them as ways to receive donations. Bambenek has also seen an unusual amount of money flowing into the accounts of The Daily Stormer webmaster Andrew Auernheimer, white nationalist publishing house Counter-Currents and Christopher Cantwell, a white supremacist who became known at the “Crying Nazi” due to a viral video of him tearfully discussing his impending arrest following the first Unite the Right rally. While there were previously spans when these accounts would go days or weeks without new activity, Bembenek says he’s recently seen a flood new digital cash coming in. Since most of these transactions are for small amounts, the median donation being around $54, Bambenek suspects this activity is the result of the activation of white supremacist donor networks rather than the operators of these accounts moving money around between different bitcoin wallets. “The uptick in donations to The Daily Stormer is especially concerning because The Daily Stormer knows how to use this money to build up an infrastructure to cause problems,” Bambenek told us. Interestingly, the bitcoin wallet of Jason Kessler, the lead organizer of both Unite the Right events, hasn’t seen seen a similar spike in activity. The news over the last week has been full of coverage of Alex Jones’ “deplatforming” from Facebook, Apple, Spotify and YouTube. Jones, who runs the conspiracy- and supplement-peddling website Infowars, is just the latest controversial personality to find himself banned from social media and media platforms. In the wake of this clampdown, the far-right has been working hard to essentially create its own internet. (Check out journalist April Glaser’s excellent coverage of this, if you haven’t already.) One of the key “safe spaces” in this effort has been the social networking site Gab, which in recent months has seen its ranks swell. We believe we have an important responsibility to ensure that our services are not abused by people and groups seeking to incite violence against others. Our policies rightly prohibit this type of content, and we expect Gab.ai to abide by these policies if it wishes to use our service. Gab.ai is of course free to choose otherwise and work with another cloud service provider or host this content itself. Centralized control of internet infrastructure is the biggest threat to individual freedom online. They told us to “build our own” if we didn’t like Big Social’s policies. We did, so now they are attacking us at the internet infrastructure level. We will keep fighting and building to ensure a future for free expression and individual liberty online for everyone. We asked if they will be taking down the two offending posts. No answer yet. White Fright, The Guardian’s recent documentary from filmmaker David Sutcliffe, tells the story of how media fearmongering led directly to a planned terrorist attack on a Muslim community in upstate New York. Founded by a dozen black Muslim families fleeing the violence of Brooklyn’s crack epidemic, Islamberg is a rural hamlet about 130 miles northwest of New York City. Talking heads on conservative media outlets such as Fox News hyped threats of Islamberg hosting terrorist training camps. In 2015, failed Tennessee congressional candidate Robert Doggart shared one of those videos on his Facebook account. Around the same time, he began planning a violent attack on Islamberg. Doggart was arrested a few months later, but was put under house arrest instead of being taken to prison. However, as Sutcliffe’s documentary argues, the media failed Islamberg yet again, giving scant national coverage to Doggart’s plan. By contrast, shortly after Doggart’s arrest, a group of Somali Americans was arrested in Minnesota for plotting a terrorist attack. That incident received significant media attention. It’s hardly surprising, given that a recent study from researchers at University of Alabama found that terrorist attacks by Muslims received, on average, 357 percent more press coverage than attacks plotted by white supremacist or other right-wing extremists.